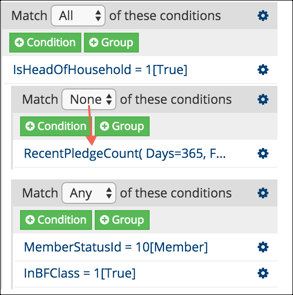 This Condition located on the Contributions category tab in Search Builder will find people based on the number of pledges they have made looking back a specified number of days. You can specify a fund. For purposes related to performance of the system, search builder conditions relating to contributions and pledges are designed to examine contribution and/or pledge records, and as a result, cannot return people who do not have contribution and/or pledge records. Consequently you cannot directly find people who have not pledged during a period. But you can do this indirectly by wrapping the reverse condition (those who did pledge) in a group and saying “not in that group”. The Recent Pledge Count condition has a Comparison of Greater than 0 and can be for a specific fund (you can leave the Fund empty to look at all funds) but it is in a group with the comparison of None. So, the search will find all Heads of Household who are either church members or members of a Main Fellowship Class who have no pledges in the past 365 days.